Experience design is part of our DNA at MJM and we love to work with clients who see the value in creating rich experiences. When OTA approached us to design the print collateral and the experience around their OTA:Bismarck event, we jumped at the opportunity. While most OTA events focus on bringing creatives and thought leaders from across the country to the region, they wanted to try something a bit different for their first ever event in Bismarck. They had recently launched their OTA Builder program which is a fellowship program of sorts for up-and-coming creatives, entrepreneurs and forward-thinkers who are making connections and growing community throughout the South Dakota, North Dakota and Minnesota region. 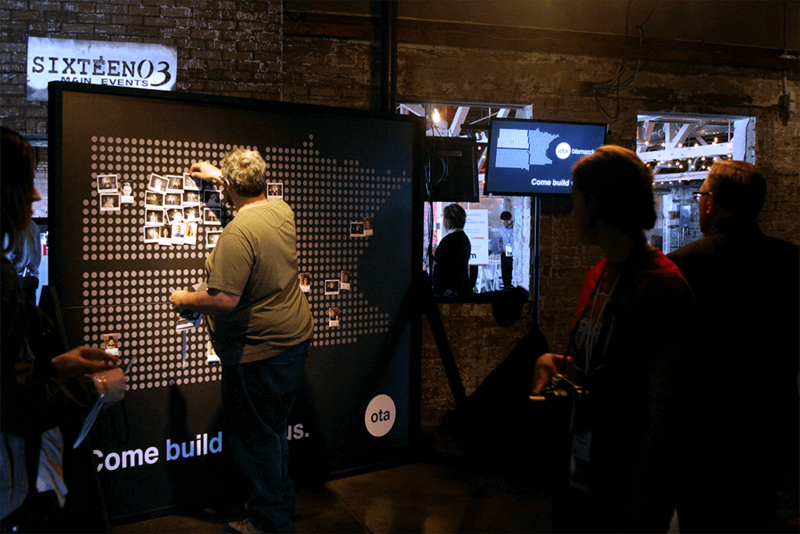 For this one-day event, OTA wanted to provide each Builder with a platform to share their ideas and projects with a wider audience, something many of them would not have had the opportunity to do otherwise. This event needed to be something truly special not only for the Builders but also the attendees who came to learn from and connect with them. 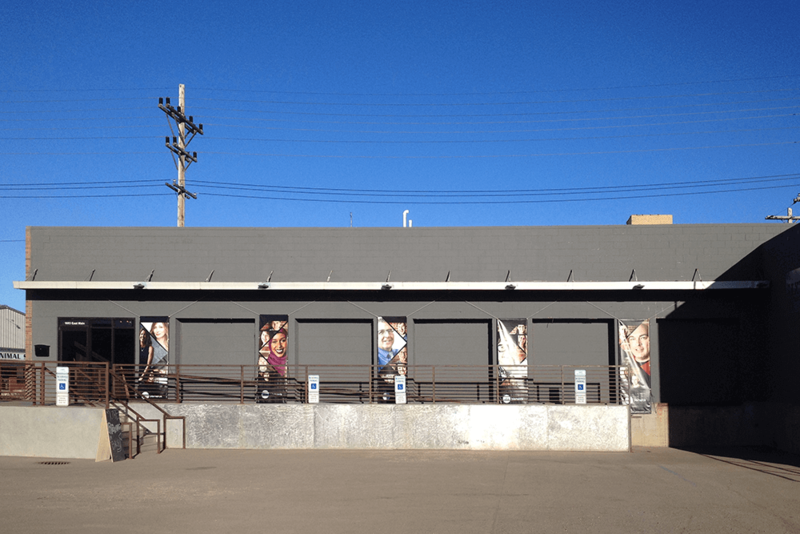 We wanted the experience to be memorable and immersive from start to finish and the experience began as soon as attendees drove up to the event location and saw massive 9-foot banners with the Builder’s faces hanging on the front of the building. The purpose of the banners was not only to create impact as soon as people arrived, but also to elevate the Builders and give them the special treatment that people in this region rarely receive. 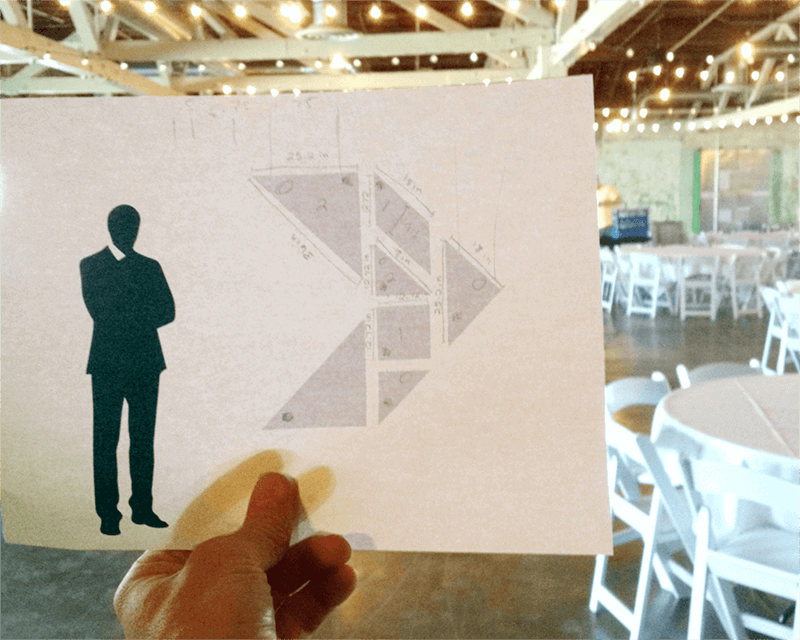 The event space was divided into three separate rooms. 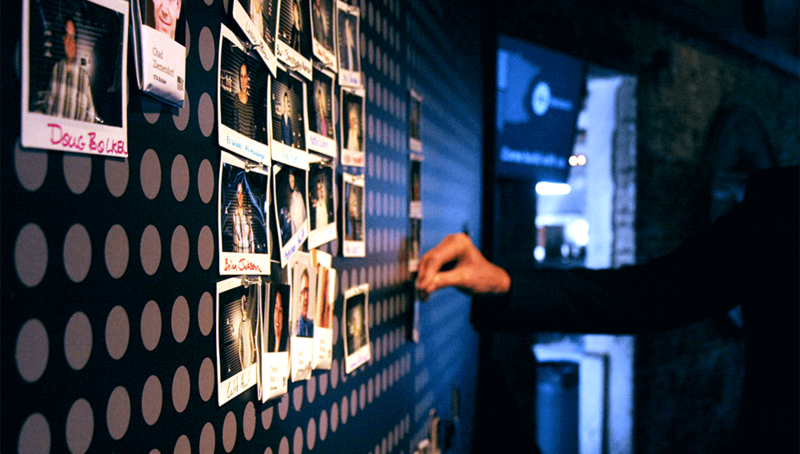 In the first entry room, attendees were greeted by volunteers who took Polaroids that the attendees then pinned to giant foam-core map of the OTA region. It was a physical act that not only allowed attendees to say “This is me and this is where I call home,” but also illustrated their connections to others in the region. Also on the map was a packet of “calling cards” for each Builder that attendees could take freely so they could get in touch with any of the speakers they found particularly interesting or inspiring. 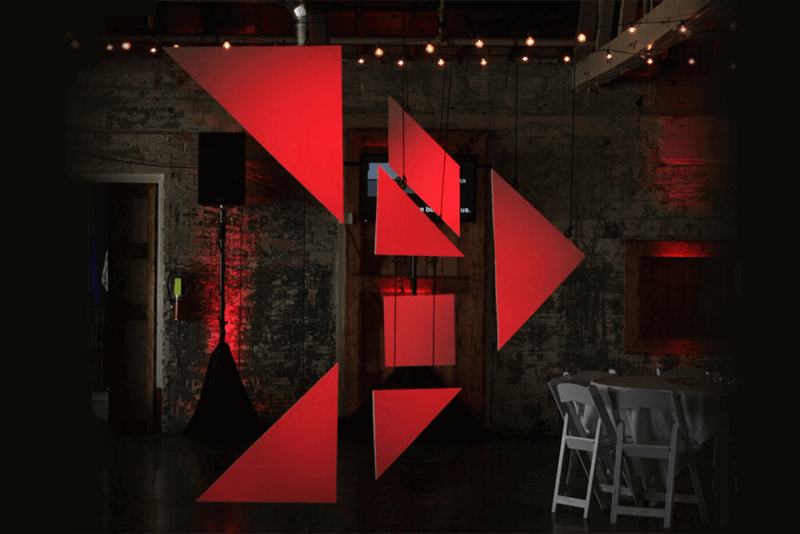 When they entered the second room, the first thing attendees saw was a large tangram arrow hanging from the ceiling. 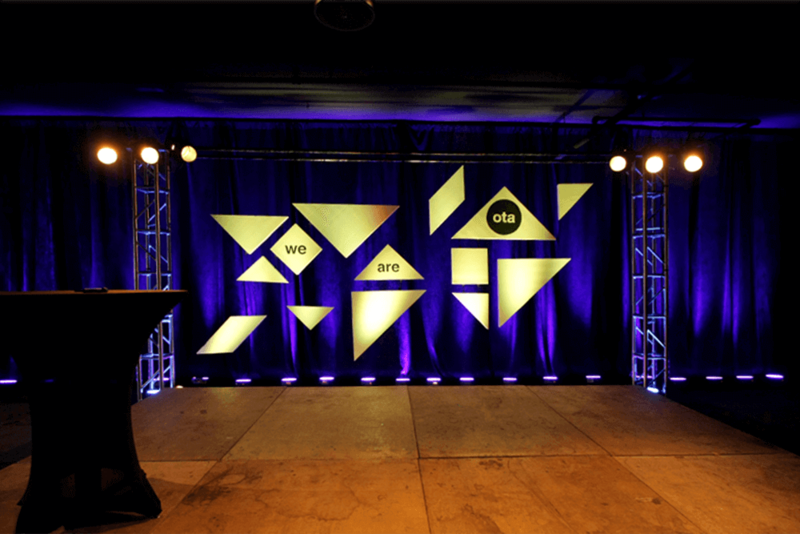 This served a dual purpose of being something engaging and interesting to look at from every angle of the room as well as being a practical piece that pointed attendees in the right direction for the main stage. The tangram concept was carried throughout the entire event and was inspired by the Builders themselves. Tangrams use basic shapes but when they are combined, the possibilities for what they can be is endless. Similarly, the Builders are using the tools they have to better the region but when they are brought together, they have so many more options open to them. 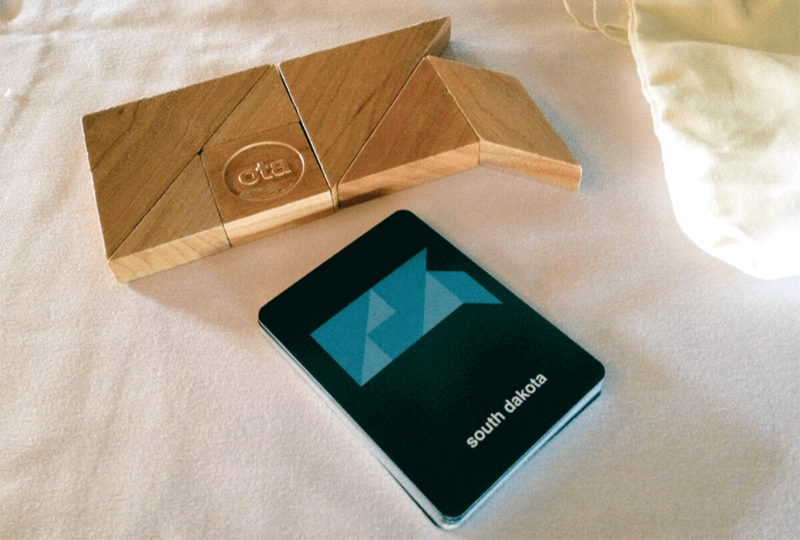 During the social times in between events, there were custom wooden tangram sets on each table and a set of puzzle cards related to OTA. They were meant to stimulate connection and collaboration and give people a chance to experiment and make whatever they wanted out of these shapes. The third and final room was the main stage area. The tangram idea was carried through onto the stage background with an abstract collection of shapes that moved subtly upward symbolizing forward motion. We painted “We are OTA” onto three of the shapes to remind everyone on stage and everyone in the audience that they are the ones who give shape to the amorphous entity that is OTA. One of the recurring themes for the event that was printed on the programs and name badges was the Teddy Roosevelt quote “Do what you can, with what you have, where you are.” The Builders exemplify this message with the good work they are doing for this region and we wanted to celebrate that by doing good work for them and OTA. The tools we used were just plywood, foam core, a working knowledge of geometry and whole lot of sweat equity, but together we hope they created a distinct experience that everyone who was a part of this event will remember for years to come.